Chain stitches are the foundation of everything that is crocheted. Learning how to crochet a chain stitch is really easy and is one of the first things that anyone learning to crochet should do. Simply follow the instructions below to learn how to crochet chain stitches. 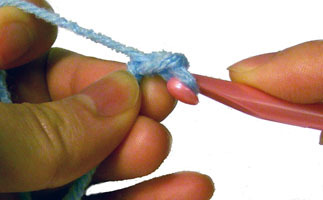 Step 1: Always start by making a slip knot and place the knot on your hook. 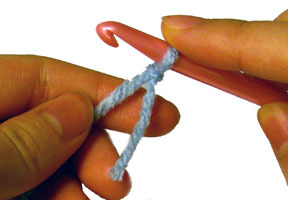 Step 2: Yarn over (wrap the yarn over your hook). Step 3: Pull the strand of yarn through the loop. Congrats! You just made one chain! 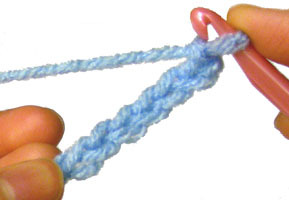 Continue to yarn over (yo) and pull the strand of yarn through the loop to create more chains, repeating steps 2 and 3. Here is what a series of chains look like. If you decide to follow a crochet pattern, it will tell you how many chains to make. Note that you should always have at least one loop on your hook the whole time. From time to time you may have to count the number of chains you made. When you are counting the number of chains you made, do not count the chain on your hook. This entry was posted on Sunday, March 22nd, 2009 at 9:50 PM by Rachel Choi	and is filed under Tutorials and Help. You can follow any responses to this entry through the RSS 2.0 feed. You can leave a response, or trackback from your own site. Cool! I’m glad I could help Dottie! This is the best help that I could find in learning to do slip knot and chain!! I am so excited and thankful that you put this on the web! I will continue following your directions. Hi Rachel, I have a doubt about the turning chain.. I figured it was ch 1 for sc rows, ch 2 for hdc, ch 3 for dc and ch 4 for trebles… but i have come acorss patern that say ch 2 for dc rows… have I been doing this wrong? Chitra, I’ve used both a ch 2 and a ch 3 for dc. It depends on the pattern. Thanks a lot Rachel. I’m still a newbie crocheter, but I love to modify and create simple patterns. Do you have any any tips for me… general rules to keep in mind when creating/modifying patterns? 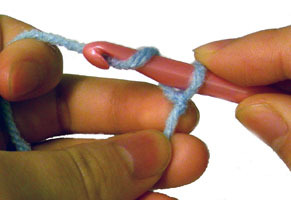 Hi Lu, after you making your first chain, move the loop on your hook back to the part of the hook that is leveled. This will make the loop larger so that it can fit over hook. The edge where the hook is, is normally skinnier than the rest of the hook. Also, try not to pull the strand of yarn that is in your hand when you are making your second chain, because that is what tightens the loop that is on your hook. Chaining is simple, but no matter what I do, it always seems that once I get to the next row, it seems like my chain is too tight, causing it to roll in a corner the further up I go. I can never seem to get it comfortably loose. Does that make sense? Hi Melissa, try making your change with a slightly larger look than the rest of your work. Sometimes it is normal for your work to curl a bit, try going on to the next row or 2 to see if it works itself out. Where did you get your crochet hook? Is the width of a chain the same as the height of a sc? Hi Sarah, yes, the width of one chain is the height of a single crochet. I don’t remember where exactly I got the hook from, it’s pretty old. I think it was either at Michaels or Joanns. If your instructions start out by telling you to “ch 10”, do you count the initial slip knot as the first chain stitch? Or do you make the slip knot and _then_ make 10 chain stitches? Hi David, the slip knot doesn’t count as a chain. So you would make the slip knot then make 10 chains. I’m using your instructions for a school project, in order to cite this page correctly I need your last name. I would greatly appreciate you sending it to me via e-mail. Hi Bailey, my full name is Rachel Choi. Feel free to learn more about the Crochet Spot Team on the About Page if you’d like. how do I crochet round? My question is, every time i di a foundation chain I end up w a super twisted thing & can’t tell what loops to “use” when doung the next row. How can i prevent this? I suspect it’s something to do w how my yarn hand holds the chain? Can you help? It might be the way you hold your work, but there’s no way for sure of knowing without actually seeing you. My advice would be to take your time and crochet nice and slow. Maybe that will make it turn out neater? Also, try to make some shorter chains and see if that also twists. If it doesn’t you may be able to compare the difference in what you are doing to see what the problem might be. Practice makes perfect, so keep up the crocheting! I’ll do that, thank you for replying! Wondering if you could post something about how to count stitches. I’m so confused on that. And maybe counting the rows. Thanks so much.